299 pages | 108 B/W Illus. Written at the undergraduate level, Cooking as a Chemical Reaction: Culinary Science with Experiments provides experiments geared for students in culinary arts, nutrition, dietetics, food science and technology, and gastronomy programs. It is intended for students with limited scientific background who are studying different aspects of food preparation and processing. The text uses experiments and experiences from the kitchen, and other food preparation and processing areas, rather than theory, as the basic means of explaining the scientific facts and principles behind food preparation and processing. This textbook is designed so that students can first perform certain experiments and record their observations in tables provided in the book. The book then explains the science behind their observations. 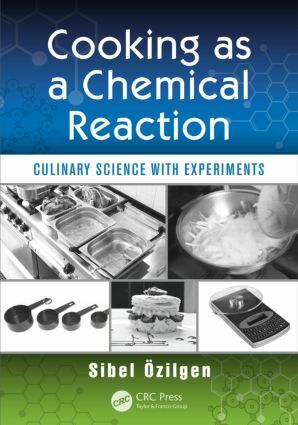 By conducting experiments and using experiences from the kitchen, and other food preparation and processing areas, this textbook engages students in their own learning process. Many concepts throughout the book are marked with a symbol that indicates the concept is one that they will come across frequently not just in this text, but in the kitchen and other food preparation and processing areas. A second symbol precedes the scientific explanation of the observation made during the experiments in the chapter. At the end of each chapter, students are presented with important points to remember, more ideas to try, and study questions to reinforce concepts that were presented in the chapter. The book is designed for each chapter to be read and studied in chronological order, as the concepts of each chapter will reoccur in subsequent chapters. With this book, students are able to make observations that they will frequently see in the kitchen and other food preparation and processing areas and learn the science behind these phenomena. Thus, they will understand how to control these phenomena, allowing them to create new food products, improve the quality and safety of their dishes, improve the culinary presentations of their food, and understand what goes wrong in the kitchen, and other food preparation and processing areas.